Have I mentioned how much I love the way Skype allows me to teach my own 7th grade students all day and still have time for a virtual author visit with kids halfway across the country before I make dinner? What was the inspiration for GIANNA Z? My students and their mandatory 7th grade leaf project. How many drafts did you have to write before it was published? 18. Then we did copy edits. Are you going to write a sequel? Yes. I already did. Zig is the main character in that one. If you’d like to read it some day, please write a nice letter to my publisher to let them know! What’s the last movie you saw? Night at the Museum: Battle of the Smithsonian, which was fun because I’d just been to the Smithsonian for research last spring. What’s your favorite book? It’s so hard to choose, but I have to say Harry Potter and the Goblet of Fire. And I loved When You Reach Me, too. Hey! We’re reading that book now. Will you play $20,000 Pyramid with us? Sure! Turns out I didn’t actually win $20,000 but that’s okay. 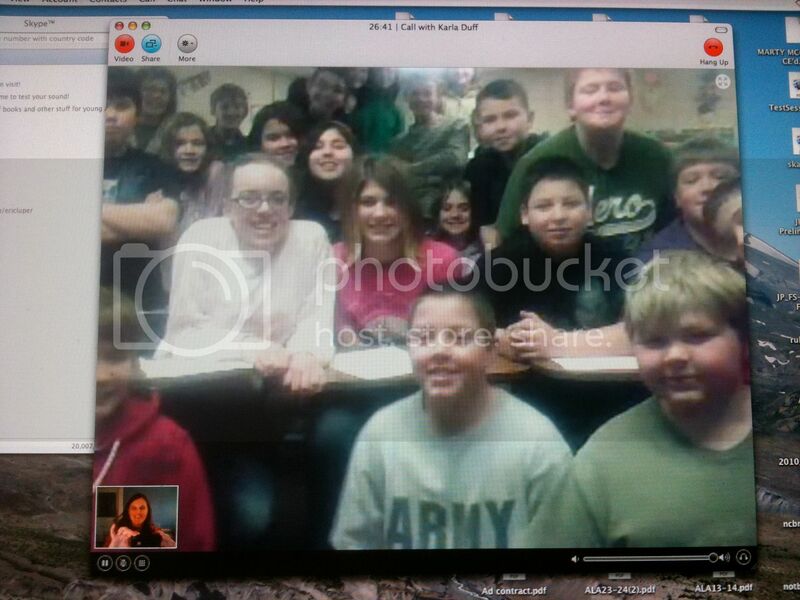 Chatting with such a fun, interesting group of kids was priceless. Thanks, 6th graders and Mrs. Duff! This entry was posted in Uncategorized and tagged author visits, skype. Bookmark the permalink. Both comments and trackbacks are currently closed.